1906 - Inverell School of Arts Committee commenced construction of a new School of Arts in Evans Street, Inverell. 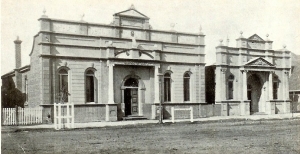 1909 - The School of Arts Hall was opened alongside the School of Arts Building. 1938 The School of Arts Committee ceased to exist. 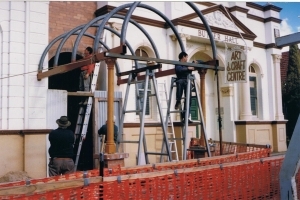 The Inverell Municipal Council took over the two buildings and provided a public library in the part of the Town Hall which had an entrance to Evans Street. The School of Arts building became the Municipal Council Chamber and administrative offices. The School of Arts Hall was renamed the “Butler Hall” in honour of Alderman S.J.S. Butler, who had been an Alderman & Mayor of the Council. 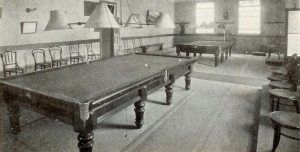 The Hall was used as a supper room when Balls were held in the Town Hall. 1963 The Inverell Municipal Council vacated the School of Arts building and then leased it to the Department of Technical Education for Secretarial Studies. 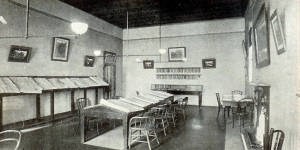 Butler Hall was also leased to the Department of Technical Education for Rural Studies. 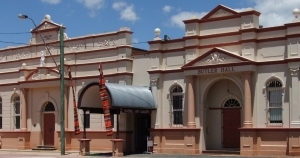 1971 - Inverell Art Society was granted permission by Council to use the small annex at the side of Butler Hall. A pottery workshop, equipped with wheels & an electric kiln, was set up. This area is still used by potters. 1972 - Inverell Art Society was allowed to use the entire Butler Hall building, at a nominal rent, for the purpose of setting up an Art Gallery. After much cleaning, painting & internal modifications, the Inverell Art and Craft Centre was opened to the public. 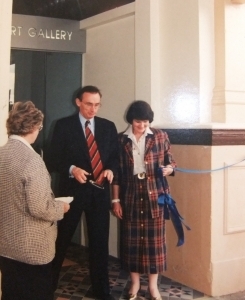 1995 - The School of Arts building & Butler Hall were linked together to form the expanded Inverell Art Gallery as it is today. The Inverell Art Society worked tirelessly to raise the funds to bring this project to its completion.